Sometimes in the midst of all my random acts of kindness, I get thrown for a loop by someone blessing me instead. It’s always a funny feeling being on the receiving end of a RAK. For starters I absolutely LOVE surprises, so this alone makes my day no matter what RAK is being done! Second, I am learning how to be gracious in acceptance… for so many years I would push away kindness as if it was an unwelcome obligation someone was doing for me. It wasn’t until I had a dear friend look me straight in the eyes and say, “Look. Here’s the deal. 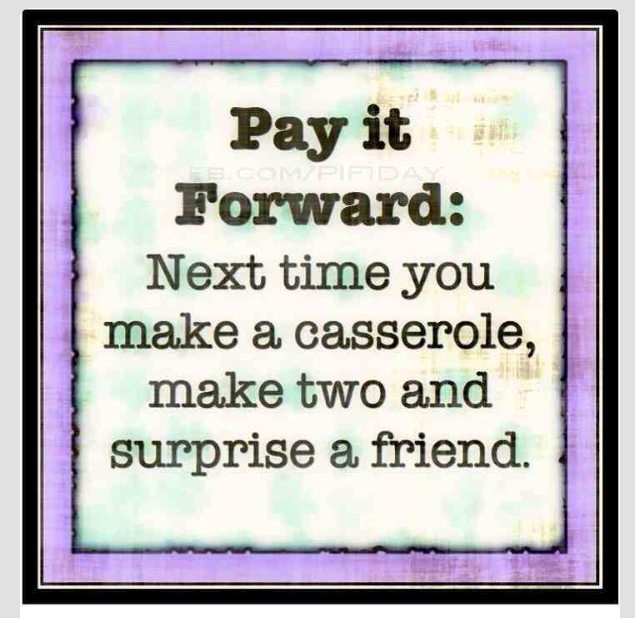 You know how wonderful it feels to do something nice for someone else. Why are you taking that joy away from ME?” Whoa! Talk about perspective! Since that conversation, I have tried really hard to simply enjoy the moment (whatever it may be) and remember that RAKs are actually about TWO people, not one! This week, I was blessed by not one RAK, but two! Seriously?! That’s crazy! Earlier in the week when I went to tutor a student at his home, his mom, Rachael, had already made me dinner for the night. “I really made it last week, but I put it in the freezer because I knew you’d be back today!” It was a HUGE casserole dish filled with spaghetti and homemade sauce (so yummy!) and her son made the sweetest card in appreciation of the help I was giving him with tutoring and an upcoming project in school. It was such a thoughtful and unexpected gift! 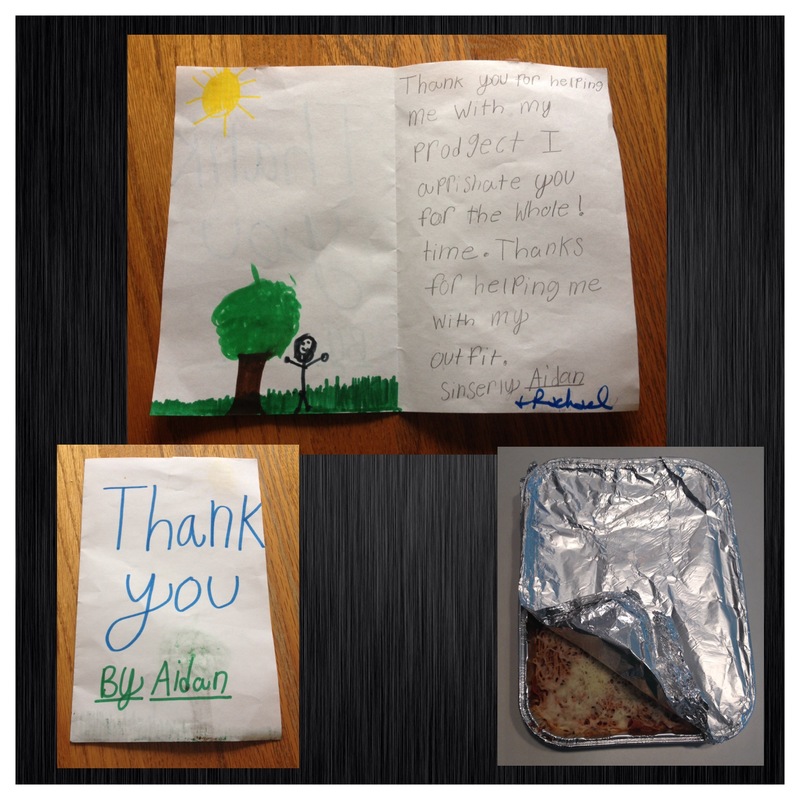 And let me tell you – it totally saved me, too, because that night was crazy with taking kids here and there to practices and activities – if it wasn’t for Rachael’s generosity, my family may have been making peanut butter and jelly sandwiches for themselves instead! 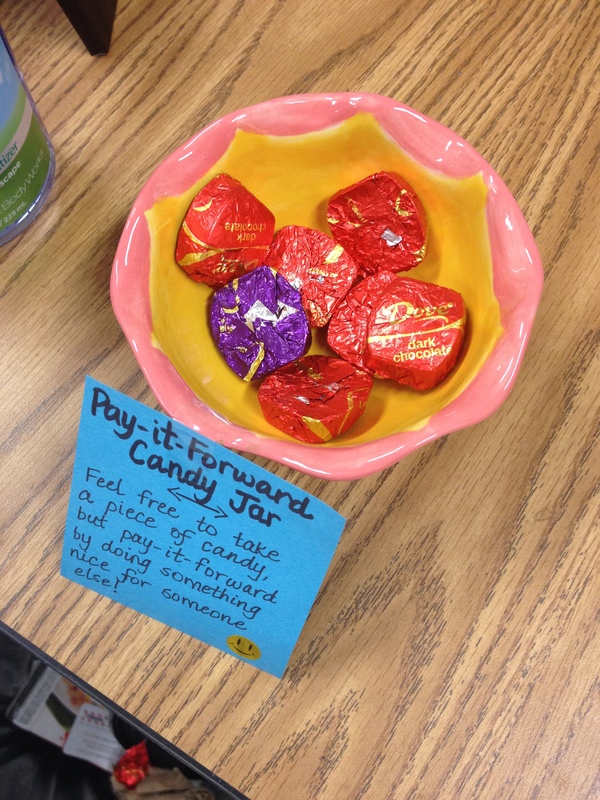 I saw a neat pin on Pinterest this week that reminded me of this RAK… I think I will do it soon to pay-it-forward! My next RAK received was the following night – the night I actually did the Rainy Day Joy RAK. I got home much later than normal, following an evening meeting across town, and as I was walking up the steps to put my youngest child to bed, I noticed a small cardboard box waiting at the foot of the stairs addressed to me. “FRAGILE” was labeled on the side in handwritten letters and I could see from the return address it was a package from my sweet friend, Sarah, who lives about 2 hours away. After getting my kiddos settled into bed, I returned back downstairs and eagerly opened the box. “What on earth did Sarah send me… and why? ?” Even as the scissors sliced through the packing tape, I was wracking my brain to think of something I had loaned her or left after our last visit together… I was completely perplexed! 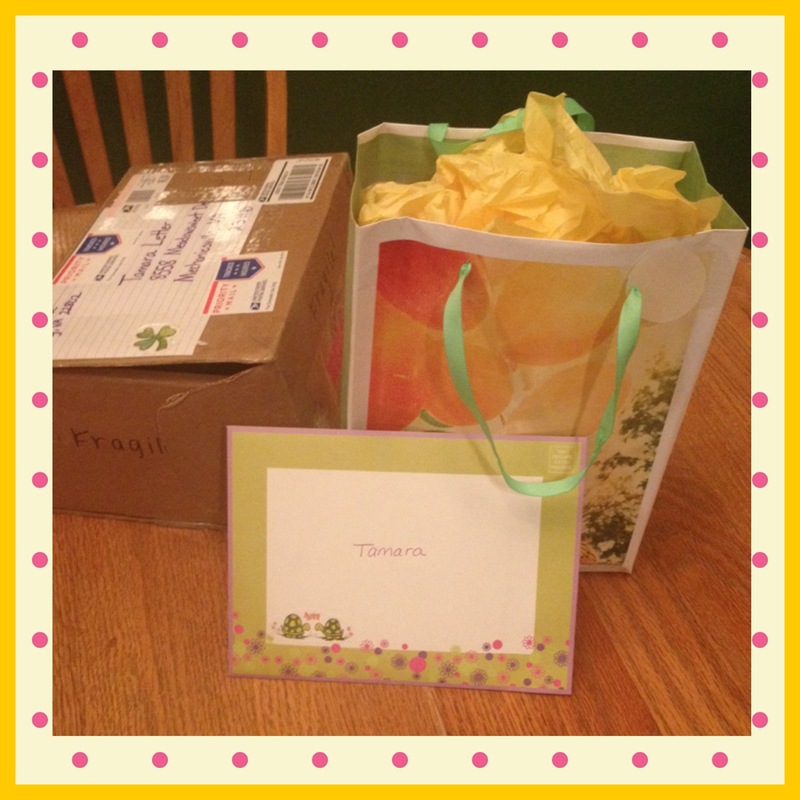 Inside the box was a bulging gift bag overflowing with yellow tissue paper and a card addressed to me. What in the world?! Sarah sent me a gift to celebrate my milestone accomplishment of 100 Random Acts of Kindness! Right then I got a lump in my throat. Her card was so very sweet, words spoken from the heart, and it made me naively realize, yet again, that these RAKs matter! You DO read my stories! WOW! And best of all, what’s important to me is valued by many of you as well. How blessed I am to have so many wonderful cheerleaders and encouragers in my life! As I opened the bag (and wondered to myself, “What is fragile?”), I saw that Sarah had individually wrapped several items in tissue paper. Each item was silly and magnificent as Sarah had used post-it notes to explain the purpose behind each item given. “Mommy, what is so funny?” my daughter asked as my unfiltered laughter interrupted her homework. I could barely talk through the giggles. “Look!” I said, pointing at the ziplock bags, “I wrote about how it seems like I always have ziplock bags in my car because they magically seem to appear when I need them – now I really DO have ziplock bags to keep in my car!” She shared in my excitement as I opened yet another surprise. “And look! 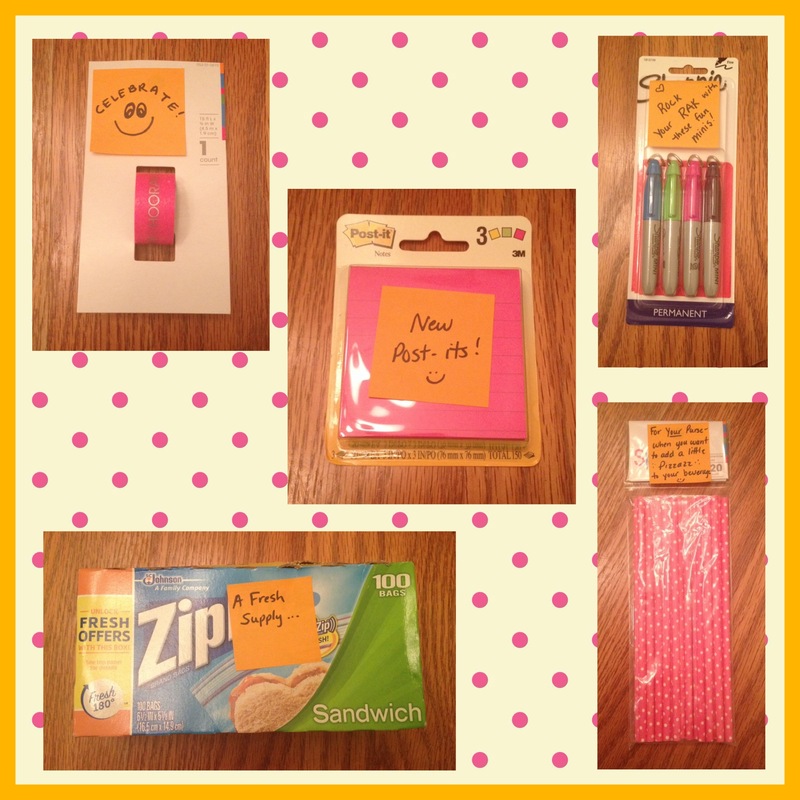 Post-it notes! Bahahahaha! I LOVE post-it notes! !” All of a sudden it hit me. 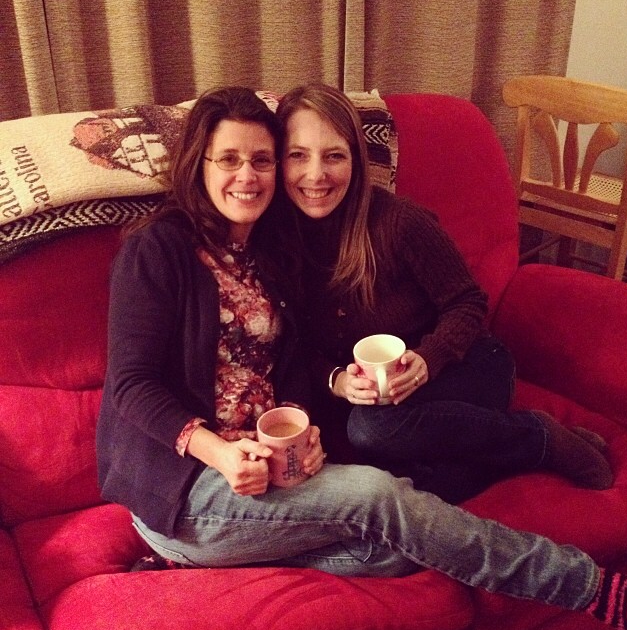 I needed to be sharing this joy with Sarah! So I called her cell number (even though it was late and I knew she would be asleep) and I left a rambling, laughter filled message on her voicemail. “I wanted to open the presents with you because I wanted to you see how fun this is! Thank you so much! You are such a wonderful friend!” It was merely a snapshot of my moment, but I wanted her to experience the pure JOY that was flowing out of me with her gift. Then I came to the very last gift, wrapped so carefully in paper. As I gently removed the covering, the lump in my throat returned once again as I tried to read through my tear-filled eyes. 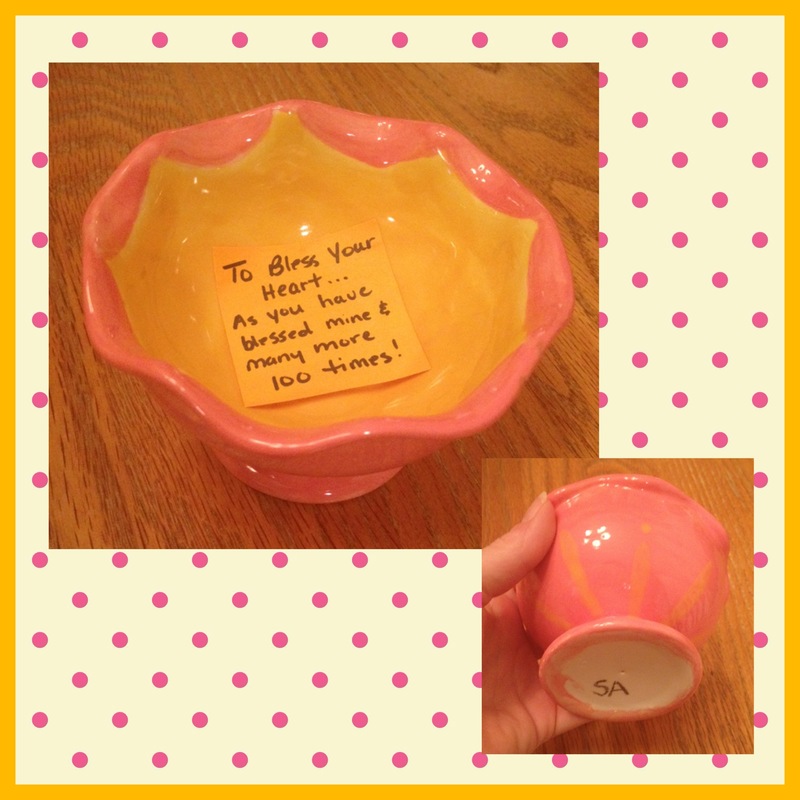 Sarah had purchased and painted a small cup and included the little note “To Bless Your Heart… as you have blessed mine and many more 100 times!” It was such a sweet gift. Right there in that moment, I couldn’t make a single sound as the tears flowed down my cheeks. 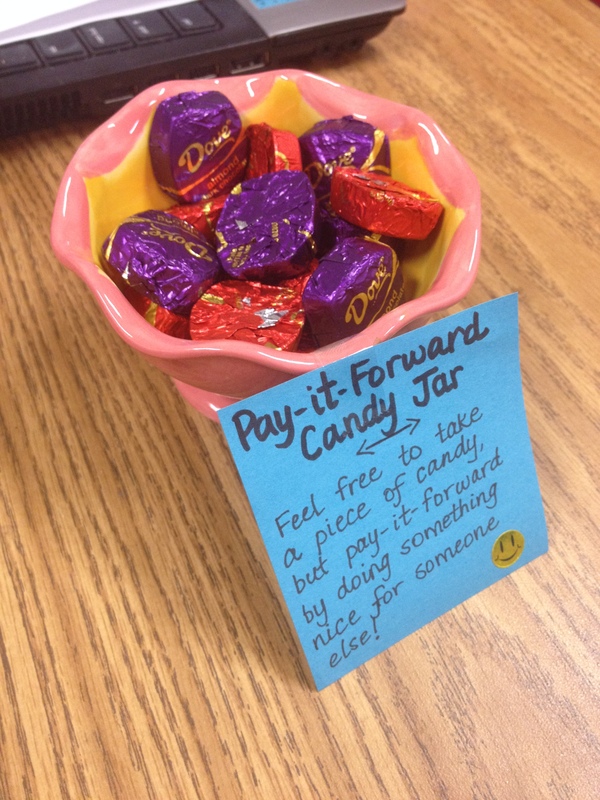 How fun it would be if everyone who took a piece of candy, commented on this blog of things they did to be kind to others. After all, sharing our experiences with someone else is half the fun! Now I need to make a trip to the store to buy more candy!